It’s immediately obvious that the Dyson Air Multiplier is no ordinary fan. There are no blades, and it looks more like modern art than an appliance that cools a room. The lack of blades is Dyson’s groundbreaking innovation. The Air Multiplier uses loop amplifiers to increase airflow, similar to the science behind turbochargers and jet engines. It’s engineered to draw in a small amount of air at the base and accelerate the air flow as it circulates around the aerodynamic collar (it can amplify airflow 15- to 18-fold, depending on the model). 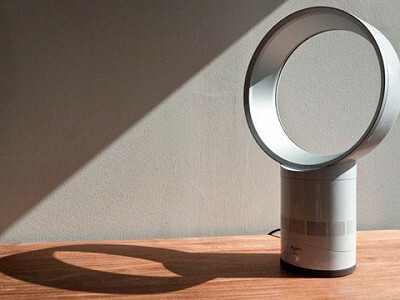 As a result, the Air Multiplier produces a smooth stream of air, like a gentle breeze, rather than roughly chopping up the air like traditional bladed fans do. A dimmer switch provides precise airflow control, and the pivoting base makes it easy to control the direction of the air. Plus, with no blades or a grille, Dyson’s fans are safe for people and pets and very easy to clean. The blending of science and design in the Air Multiplier is seamless. It’s what we’ve come to expect from James Dyson, the maverick designer and engineer who devised “cyclone technology” to create vacuums that don’t need messy bags and won’t lose suction. Dyson’s vacuums took the appliance industry by storm, and his bladeless fans are set to do the same, one cool breeze at a time. Hi, this is Ryan from Dyson Customer Service. We will be available to answer questions today about our products, such as the Air Multiplier fans. ummm... I don't see a price on any of these "air multipliers"
@Susan: $300 to $400 and some dollars for these fans. @Susan: Hi Susan. You can find pricing information for our Air Multiplier fans on our website. If you have any additional questions please let us know. 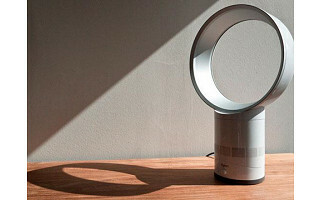 @Susan: To follow-up, please visit http://www.dyson.com/store/fans.asp for pricing information for the AM01, AM02 and AM03 fans. @ohio: They are definitely not your average fan. We agree that we all need to be mindful of our personal economic situations but it is also nice to see that innovation doesn't stop when the economy is struggling. As always, we love bringing you innovative ideas and telling the stories behind them. How long will they last? Ours get so filthy and this looks very easy to clean. @kate: To clean the Dyson Air Multiplier fan you just need to wipe the annular loop with a cloth. There is no grille to remove or fiddly blades to worry about, so cleaning the Dyson Air Multiplier fan is very simple and user-friendly. @kate: The Dyson Air Multiplier fans come with a 2-year warranty but should last for much longer when used per the instructions in the owner's manual. My local Whole Foods put in a Dyson hand dryer, and it is so fabulous. Looks a bit like the fans, -- for obvious reasons, as it is related technology. Looks sleek, stick my hands in and they dry to perfection, stops when I remove my hands. Elegant design, elegant use of resources, no mess, no waste of electricity. An engineer's idea of elegant, as well as an artist's. Dyson is truly innovating technology that I expect will be the norm in decades to come! I cannot afford most Dyson products at this time, but I will be very happy to have them in time! @MartyAnne: Thank you very much for your feedback. For those who are not aware, our the Dyson Airblade works in just 12 seconds – scraping water from hands like a windshield wiper. It’s the fastest hand dryer, powered by the unique Dyson digital motor. It forces air through a HEPA filter before blowing it onto hands, so it’s also hygienic. And it uses up to 80% less energy than warm air hand dryers. What's the sound profile? There's not much of a demo in the video clip; sounds like there could be some nagging high end harmonics. So I wonder not only about the total decibels, but about the pitch(es) of the sound. Could you add a link to a longer clip, or put up a graph of the sound spectrum? It's a lovely idea, but not if it has a hint of "jet engine" to it (at least, not for sleeping, not for me). 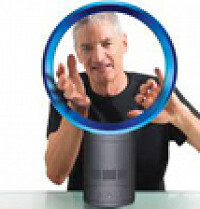 @Joy: The Dyson Air Multiplier fan reaches 65dBA on its fastest and most powerful setting. When in the lowest power mode it is at about 46dBA. This is comparable with other fans with similar outputs. We don't have a graphic available that illustrates the pitch of the sound made by our fans at this time. However, if you email your contact information to [email protected] I can run one of our fans for you over the phone so you can get a better idea of the sound that it makes. Joy - we should have included a bit of video to help you experience the sound...I'm looking into working that into our video. It’s immediately obvious that the Dyson Air Multiplier is no ordinary fan. There are no blades, and it looks more like modern art than an appliance that cools a room. The lack of blades is Dyson’s groundbreaking innovation. The Air Multiplier uses loop amplifiers to increase airflow, similar to the science behind turbochargers and jet engines. It’s engineered to draw in a small amount of air at the base and accelerate the air flow as it circulates around the aerodynamic collar (it can amplify airflow 15- to 18-fold, depending on the model). As a result, the Air Multiplier produces a smooth stream of air, like a gentle breeze, rather than roughly chopping up the air like traditional bladed fans do. A dimmer switch provides precise airflow control, and the pivoting base makes it easy to control the direction of the air. Plus, with no blades or a grille, Dyson’s fans are safe for people and pets and very easy to clean.